This complete and unabridged collection contains all 23 of Beatrix Potter's Tales in one deluxe volume with all their original illustrations. 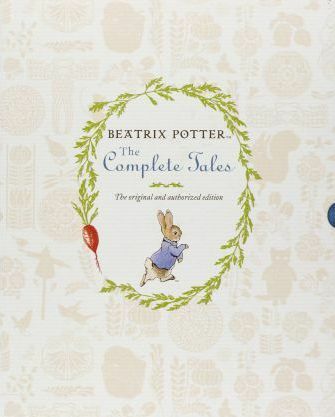 A perfect gift to introduce children to the world of Beatrix Potter, the Complete Tales is also an ideal christening present; traditional and timeless, it's a classic for any nursery shelf. Discover Beatrix's most famous character, Peter Rabbit, and meet his family and friends. There are so many exciting adventures to enjoy, told with such humour and wit it's difficult to believe that Beatrix Potter wrote many of them over 100 years ago. Children will love hearing what happens to naughty Peter Rabbit when he disobeys his mother and ventures into Mr McGregor's vegetable garden. They'll delight in discovering the fate of Tom Kitten who, like so many young children, finds it just impossible to keep his clothes neat and clean! The tales are arranged in the order in which they were first published to enable them to be read in proper sequence, as several are linked together by events and characters. A section at the end of the book contains four additional works by Beatrix Potter that were not published in her own lifetime.